A fun, fast and efficient way for us to work together virtually to create your ideal space, no matter your location or budget. From paint colors and furniture to lighting and flooring options, we’ll help you nail that aesthetic you have been dreaming about, all through email. Think of it as personal shopping for your home. Long story short…You provide us with your measurements, photos and budget as well as the fun stuff such as your personal style and Pinterest boards through the questionnaire. 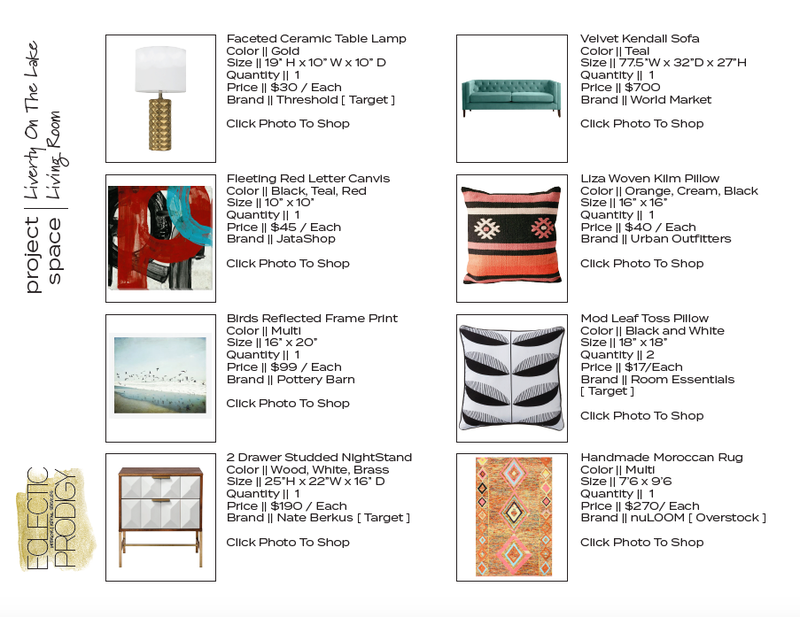 From there we will custom build mood boards, a product concept board and source list with savvy and eclectic product suggestions sent straight to your email. Not sure where all your new and existing furniture and accessories should go? We offer room renderings as well with product placed in your space! Once your space’s suggestions and plans are complete, it’s in your hands to implement at the pace you are comfortable with. You can decide whether the options suggested are right for you or to just use them as inspiration to find something else. Everything we choose is available online from some of our favorite big box retailers and small boutiques. With a click of your mouse, our suggested options can be delivered straight to your door. If you are looking for something unique or exclusive we love hunting for special eclectic items as well. Whether you are looking to recreate an 80 square foot room or a 800 square foot room, each individual space in your home is the same rate. Looking for help in your retail space? We can do that too. Contact Us to discuss retail projects or view our Retail Process here. Ready to get started? fill out the E-Decorating Questionnaire here. Interested in our 4 Hour Design Package? Learn more here.